High Quality Ultra Microfiber 300 towels 16\" x 16\". Towels come in a 10 Pack bag. 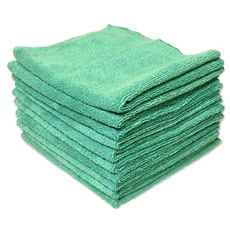 This is an all purpose microfiber towel that can be used for just about any application. Interior, Exterior, Windows, Mirrors, Wheels, Vinyl, Leather, Plastic. It is made with a AA grade, 300 g/m2 microfiber material, knit on German machines with American Polyester, and German Polyamide. It has a standard overlock stitched edge, and a sewn in label. Each 16\"x16\" towel weighs approximately 48 grams.